Colonel Charles C. Bock was born on November 24, 1925, in Council Bluffs, Iowa. Col. Charles C. 'Charlie' Bock, Jr. graduated from Purdue University with a Bachelor of Science in Aeronautical Engineering in 1949. 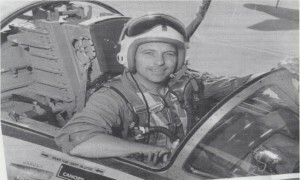 He had a long and distinguished United States Air Force career as a bomber pilot, fighter pilot, test pilot, and a military astronaut designee. Col. Bock flew 51 combat missions with the 90th Bomb Squadron in Korea and 52 combat missions with the 35th Tactical Fighter Wing in Vietnam. Other assignments included two tours in Flight Test Operations at the Air Force Fight Test Center, Edwards Air Force Base, California. He participated in many of the flight test programs at the Center and brought the first B-58 to leave the factory to the Center for a year of testing. Col. Bock was a B-50 launch pilot for the X-2 and the B-52 launch pilot for all of the first captive and launch flights of the X-15. When the YF-12 arrived at the Center, a YF-12/SR-71 Test Force was formed with Charlie as the Operations Officer. The mission was to assist Lockheed in expanding the operating envelope of the SR-71. Col. Bock retired from the Air Force in 1973 to take a position with Rockwell International Corporation as chief test pilot for the B-1 bomber program. In December 1974, he piloted the first flight of the bomber. Col. Bock was responsible for all aircrew training and had a major influence on the formulation of the B-1 flight test program priorities and objectives. He retired from Rockwell in 1981, and from 1982 to 1984 was a consultant to Northrop Corporation on the B-2 Stealth Bomber. During his flying career, Col. Bock logged over 10,000 hours in more than 100 types of aircraft and was awarded the Legion of Merit, two Distinguished Flying Crosses, and six Air Medals. In addition to his degree from Purdue, Col. Bock was also a graduate of the USAF Test Pilot School, the USAF Aerospace Research Pilot School, the Air Command and Staff College, and the Industrial College of the Armed Forces. He logged over 10,000 hours in more than 70 types of aircraft and received numerous awards including the Legion of Merit, two Distinguished Flying Crosses, six Air Medals, and the Society of Experimental Test Pilot’s Tenhoff Award and the Iven C. Kincheloe Award. He was named to the Aerospace Walk of Honor in 1994.